A military parachutist performs a jump during regular annual training in the Trans-Baikal Territory. A year ago, on Oct. 24, 2014, Google executive Alan Eustace achieved the highest parachute jump in history, jumping from a height of 135,000 feet. However, it was Soviet skydivers who originally launched the race to dive from the outer limits. On Oct. 24, Google executive Alan Eustace successfully set a new world record for the highest parachute jump, beating the height of around 128,000 feet posted just a year earlier by Austrian Felix Baumgartner. But attempts to jump from the outer limits are nothing new, and skydivers have been trying to set records for decades – Soviet jumpers were in the thick of the competition back in the 1940s and 1950s. The first parachute jump from a height over 13 kilometers (42,650 feet) was achieved on Sept. 25, 1945, by Soviet skydiver Vasily Romanyuk. After leaving his plane at the altitude of 43,000 feet, Romanyuk spent 167 seconds in free fall, setting a world record, and only opened his parachute at the altitude of 3,280 feet (1 kilometer). For the post-war Soviet Union, skydiving records were just another way of asserting its power in the new world. The USSR’s aces accomplished one impressive feat after another: For instance, Vasily Romanyuk broke his own record in 1947 by jumping from 44,000 feet (this time, he opened his parachute immediately, without entering free fall). Ten years later, Soviet test pilot Nikolai Nikitin set the bar even higher: He jumped from 50,470 feet, of which he remained in free fall for almost 48,000 feet.. 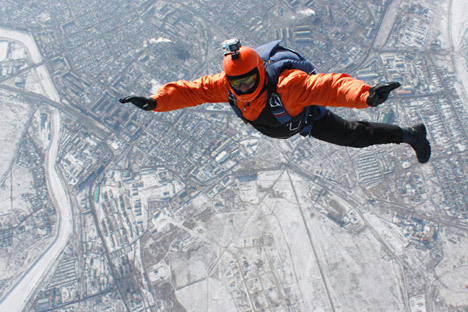 The longest surviving Soviet skydiving record was set in 1962 by Yevgeny Andreyev, who was trained by Vasily Romanyuk. Ascending to an altitude of 83,660 feet aboard the giant high-altitude balloon dubbed Volga – a 330-foot high monstrosity designed to test safety equipment for aircraft and spacecraft – Andreyev made a successful jump, spending 80,380 feet in free fall and reaching a speed of 600 mph. The Volga experiment was widely covered by the Soviet press – space fever was in full swing in the county, since only 18 months before that, Soviet pilot Yuri Gagarin had become the first human to journey into outer space. Unfortunately, Andreyev's partner Pyotr Dolgov, who was the second skydiver aboard Volga, was less fortunate: While jumping from the balloon, he hit his head on the aircraft's hull, cracking the visor of his helmet, which led to decompression and death. Dolgov's parachute opened as planned, and Dolgov's lifeless body landed without any further incident – none of the observers even knew he was dead before the landing. While Eustace's altitude record of 135,000 feet is unlikely to be surpassed in the near future, there is still some room for improvement in team skydiving. Russia's biggest team skydiving record was achieved in 2012, when the all-female team Zhemchuzhiny Rossii (Pearls of Russia) formed a giant flower in the sky above the Russian town of Kolomna. The feat involved 88 female skydivers in total. The team was even congratulated by Alexei Leonov, one of the USSR’s best-known cosmonauts. Nevertheless, the girls did not let the fame go to their heads: A year later, they created an even more elaborate formation consisting of 101 skydivers – Russia's national record to date. The feat was dedicated to the team's late leader Irina Sinitsyna, who died in September 2012 during jumps at Perris Valley Airport in Southern California. The world's record for the largest formation in free fall was set in Thailand in 2006, when an international team of skydivers formed a figure consisting of 400 people. However, the record for the largest single-nation formation was set by Russian skydivers: In 2011, 201 Russian male skydivers linked together during a jump.